Today CaptainCPS-X updated his tool MMRetroCR to V0.07 Beta 2. 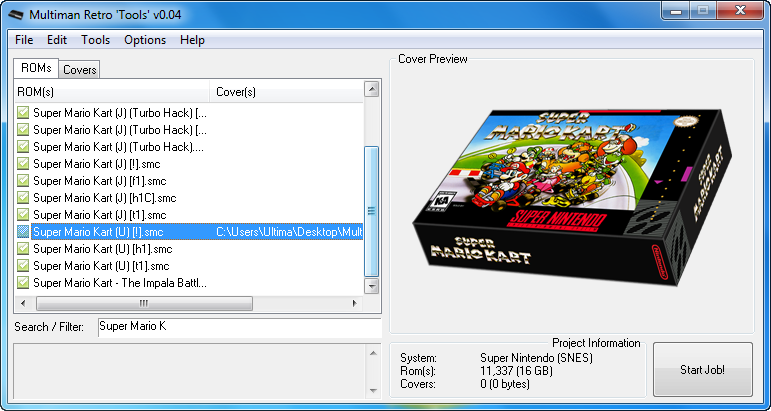 It allows you to manage and download Retro Covers for Roms when using Multiman. - Fixed menu item 'Save As...', for some odd reason it was not working. * Thanks to 'tonybologna' for the quick feedback. - Automatic ROM scanning for supported systems. - Support ROM recognition for: NES, SNES, Genesis, VBA (GB, GBC, GBA). - ZIP verification when needed, ensuring it contains a valid ROM. - Single ROM adding and removing from list. - Individual cover assigment feature for each listed ROM. - Ability to clear cover assigment for a selected ROM. - PNG and JPG covers support. - HQ Covers preview with proper Aspect Ratio calculation. - Automatic renaming of cover images to match the ROM sets. - Automatic generation of Covers .PKG files ready to be installed in the PS3 / MultiMan. - Automatic generation of ROMs .PKG files ready to be installed in the PS3 / MultiMan. - Project creation for each supported system. - Project saving and loading. - Detailed project information, with total ROMs, Covers and total size. - ROM existence verification when opening projects. - Shortcut keys for easier navigation and editing. - Options to configure each specific job. - Search / Filter of ROMs based on user text input. - Browse / Manage cover images without using Windows shell. - Search / Filter Covers list based on input text. - Browse / Manage ROMs without using Windows shell.